What does the new waste data tell us about the current status of waste management in England? Anthesis // News + Insights // What does the new waste data tell us about the current status of waste management in England? Peter Scholes, Principal Consultant in the Waste and Resources team, reviews the latest data release from the Environment Agency and what it tells us about the status of waste management in England. For those of us that regularly work with waste data, the autumn publication by the Environment Agency is quite an event. The site returns data from permitted waste facilities gives a high-level insight into the activity of the waste management sector, as well as a treasure trove of new information to help us support businesses and organisations model waste flows and capacity gaps at local, regional, and national levels. Private sector clients with a better understanding of their key market sectors, competition and potential opportunities and challenges. As in previous years, the recently published data for 2017 represents an imperfect description of the waste market, including the fact that it doesn’t contain any information on waste processing activities that don’t need an environmental permit - this includes a huge slice of material collection and processing for recycling. Nevertheless, as this is the only available data source for England that includes the both business and household waste management, it helps us understand the performance of the sector as a whole. What exactly does the new data tell us? From 2013 to 2017 there’s an upward trend of increasing tonnages of waste to landfill, despite the pressure to divert waste to more sustainable methods of disposal, with more than 43 million tonnes of waste landfilled in England in 2017. 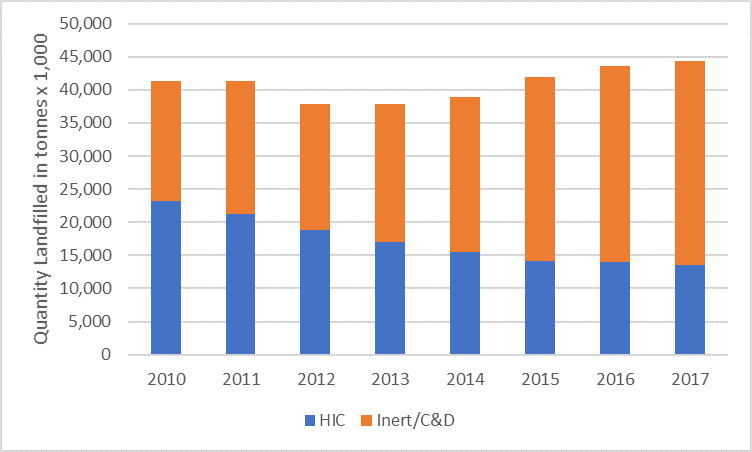 However, digging into the detail, the amount of non-inert HIC (household, industrial, commercial) waste landfilled continues to decline year on year - from 14.0Mt in 2016 to 13.6Mt in 2017 - with inert waste (mainly generated by construction and demolition activities) showing a considerable year on year increase, resulting in the overall upward trend. This can probably be attributed directly to the growth in construction activity. Data from the Office of National Statistics shows an average annual growth in construction sector outputs of +3.7% post-recession (from 2010 to 2017), presumably resulting in an increase in the waste produced by these activities. EA reported landfill capacity data shows a continued reduction in available landfill void, to 125Mm3 for inert only landfill and 270Mm3 non-inert landfill in 2017. This is equivalent to a lifetime of 11.1 years for inert waste only and 10.7 years non-inert waste, at 2017 input rates. This compares to 13.6 years inert/11.5 years non-inert in 2016 and 14.1 years inert/12.1 years non-inert in 2015, showing a year-on-year reduction as facilities fill, sites close and permits are not extended. 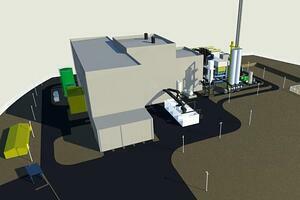 Anthesis recently conducted due diligence on plans for one of the biggest Energy from Waste facilities in the UK. Energy from waste facilities data shows a continuing increase in energy recovery capacity to 12.1Mtpa in 2017, with 10.6Mtpa throughput - a 10% throughput increase on the previous year and 150% increase since 2010. There are several facilities reported by the EA as newly on-line for 2017, including: Mercia EnviRecovery (Severn Waste, 200ktpa), Severnside Energy Recovery Centre (Suez, 400ktpa) and Cornwall EfW Centre (Suez, 240ktpa), all built to service local authority contracts. This year is likely to represent the end of the local authority PFI/PPP procurement programme for such facilities, reflected in the fact that the majority of EfW capacity in 2017 is dominated by facilities for municipal waste funded by long term contracts. We expect new capacity from 2017 onwards to be more aligned with merchant capacity for commercial waste. 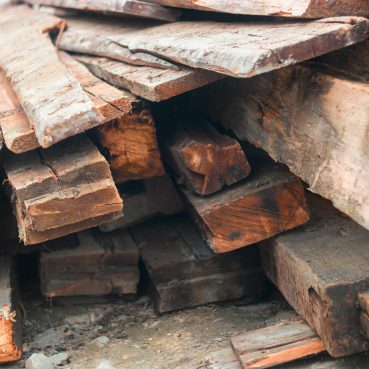 This provision of energy recovery capacity for local authority collected waste (LACW) suggests that the majority of HIC waste landfilled comes from industrial and commercial sources, representing a huge opportunity for developing merchant EfW capacity. Consolidating landfill and EfW data shows that the tonnage of non-inert residual waste - 'black bag' waste which isn’t separated for recycling - is increasing year on year, meaning the reduction in reported landfill volumes is less than that expected from diversion to EfW alone. If the amount of RDF (refuse derived fuel) exported to Europe for energy recovery is added1, growth since 2013 is even more evident, as illustrated below. 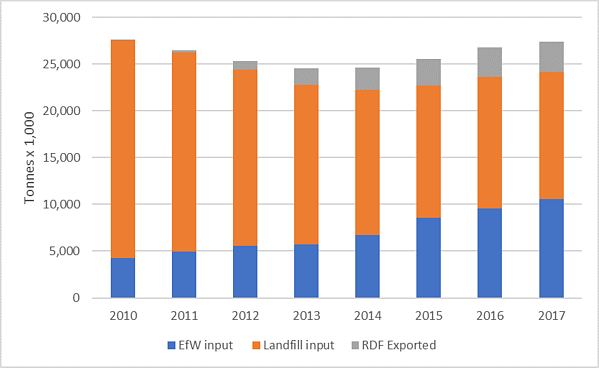 Source: Environment Agency - non-inert residual waste volumes to landfill, EfW and RDF export, 2010-2017. 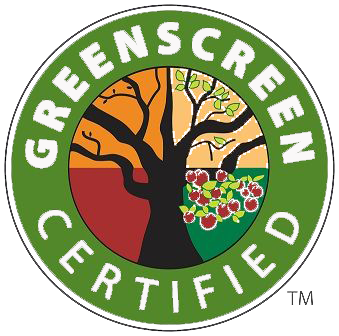 A slowdown in overall recycling rates? The EA returns data doesn’t report a significant proportion of the waste recycled in England. A large part of the recycling sector, particularly for commercial and industrial waste, is operated by smaller waste management businesses as part of the supply chain for larger operators. Some of these facilities can process as much as 260ktpa of glass or 156ktpa of paper/card without the need of a waste permit. Data from local authorities2 have shown a slight increase in LACW arisings year on year since 2012, with fairly static recycling rate of 43-44%. Packaging waste recycling3, between 2016 and 2017 increased by 2.4% (mostly paper and plastic) reaching 6.3Mt in England. So, although there is some evidence of small increases in recycling, growing residual waste volumes suggest that overall waste growth has exceeded growth in recycling in England. 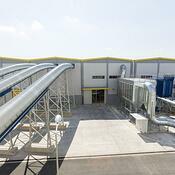 What does all this mean for waste management? The newly published data shows that the move from landfill to energy recovery is continuing, as the first step in implementing the waste hierarchy. Now we need to make the next step by focussing on good quality recycling ready for re-use as secondary commodities. 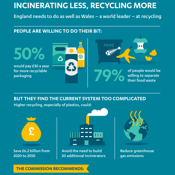 If the hotly anticipated waste management strategy for England (expected imminently from Defra) intends to adopt EU circular economy targets for recycling of up to 65%, and puts additional focus on plastics, there are some issues that will need urgently addressing, including the collection, segregation and quality of materials for recycling, and the demand for recycled material in the manufacture of new products. While the quantity of recyclables could be increased by building on the collection and sorting infrastructure we already have, the need for improved quality of recyclables will require investment to move towards more refined recycling processes to produce the raw materials, chemicals and high-quality products required for sustainable manufacturing. With over 16 years’ experience, Peter Scholes has considerable knowledge of the waste management and resources sector. He has particular expertise in the collection and use of commercial and industrial waste data having delivered five large scale surveys, plus EU methodology development work. RDF export data is published separately by the Environment Agency; note this volume data does not include losses in processing.